This fine Dan mask is a mask of the ‘Deangle’ type or ‘Tangle’. 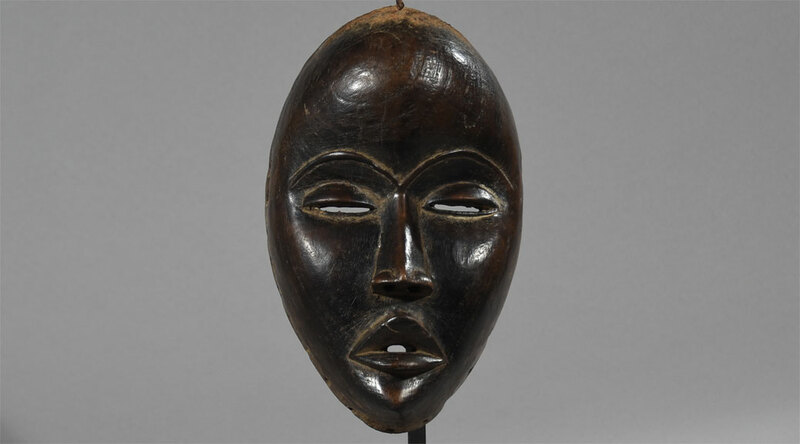 Men will wear these ‘Deangle masks’, as well as full body costumes with raffia skirts, while watching over and looking after the young men during their initiation time in a secluded bush camp. Here they are instructed on the values, myths and traditions of their tribe. These ‘Deangle masked beings’ take care of the young boys by giving them food and leading them to visit the village etc. A Deangle mask is also thought to portray a woman, though it is man wearing it, while dancing in a style thought to be feminine with gliding steps and graceful movements. The Deangle dances for all to see as ‘she’ entertains and instructs the village in peaceful pursuits. 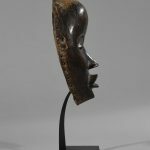 Each Deangle mask reflects the skill of the artist and taste of the patron and while local variations occur there are long established criteria for Deangle that reflect a long standing Dan aesthetic and cultural style. The well-crafted and at the same time highly ‘cubist’ forms are remarkably and diligently used in portraits by artists such as Pablo Picasso and Henri Matisse. 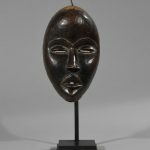 The distended forehead, as well as the striking protruding parts of the square nose and the large, wide mouth with ‘drooping’ corners of the mouth are all features that suggest a strong artistic influence of the styles of the Dan subgroup the Dan Kran, also known as Wè or Ngere. It is possible that this ‘Deangle mask’ was produced by a very good Dan Kran carver. An impressive piece with a ‘powerful’ iron pin on the crown. Age: Mid 20th Century or earlier. Provenance: Bought from a Bruxelles gallery ex private Belgian collection. Condition: Despite age and use the mask is in an excellent quality, apart from a very small tear in the upper lip. Dark brown patinated wood. The inside of the mask has clear traces of diligent application. ‘Die Kunst der Dan’ by Eberhard Fischer & Hans Himmelheber, Rietberg Museum Zurich, fig. 78, 79. ‘The Arts of the Dan in West Africa’, (Zurich, 1984) by E. Fischer and Hans Himmelheber. ‘Notes on the Poro in Liberia, Papers of the Peabody Museum, Archaeology & Ethnology, XIX, No.2 (Cambridge, MA, 1941)- and ‘Agents of Social Control in Northeast Liberia’, Papers of the Peabody Museum, Archaeology & Ethnology, xxxii, No.2 (Cambridge, MA, 1950) by Harley, G.W.